Although there has been personal, consistent involvement in local ministerial outreach, it has been nine years since I was commissioned to lead a multi- national group of Christian workers to four Asian Countries in September 2009 and to go solo to a Caribbean nation in December 2009. It is nineteen years since I was called to a solo long- term outreach also in an Asian nation. When three ruptured Cerebral Aneurysms and Craniotomy prematurely ended this engagement in November 2002, I thought the end to my Christian work, local and international had arrived, “But God….” He had a different plan to keep my desire to go into other lands alive and to provide opportunities. It began in a dream while vacationing in The Bronx, New York in summer of 2017. I dreamed of a young woman, who resembled my younger daughter. In the dream, the gorgeous young woman seemed to have recently given birth to the cutest twin girls. My daughter was expecting a girl. I thought the dream was of my daughter, so I suggested she verifies the number of babies she was REALLY expecting. She totally ignored me. I thought; “What if she and her OBGYN were mistaken, and she is carrying twins or more. Would I have a snug, “I told you so satisfied smile”, or would I be as supportive as before. No one but God knew. The reality was, God was up to something. He did another of His amazing Orchestrations of human affairs and caused the young woman of my dream and me to meet in a MCDONALD’S at the corner of East 232nd Street and White Plains Road in Bronx NY. Road . She should have been staying in Brooklyn adjacent to her delivery hospital, but human changeableness made her move to the Bronx only two blocks from where I was staying. AMAZING? What is the likelihood of dreaming of complete strangers then meeting them personally in a fast food restaurant from which I eat only the baked apple pie? Only Father can take ALL the circumstances of our human existence and work them for good to those who love Him and whom He calls to fulfill His decrees. Well, it happened! This was no fluke, coincidence, accident or happenstance. This was Father’s sovereignty at work. He invaded and carefully orchestrated human affairs to fulfil His divinely pre - ordained purposes. For this young woman, it was for her to find friends and servants in America during her maternity hiatus from her native land to have her twin girls SAFELY at Down State Hospital in Brooklyn, New York, USA instead of in her native land Saint Lucia to Avoid MEDICAL complications. Personnel, thought it was one of the St. Thomas Virgin islands. Well, they were all mistaken. Saint Lucia is An Eastern Caribbean island..
From early geography lessons in Jamaica about the Caribbean, I learned the islands were divided into: “Greater Antilles; Lesser Antilles; the Windward and Leeward Islands. Being one of the smaller Caribbean Island, Saint Lucia is in the Lesser Antilles. FYI Cuba, Jamaica and Puerto are in the Greater Antilles. So, what was Father’s purpose for me in this scenario? I sensed several, yet there are all part of one grand divine plan. First, it was a test in an my acceptance of God’s Sovereignty to do whatever pleases Him. Secondly, Would I believe God uses various means include dreams and visions to communicate His will in this, “Post modern” era. Thirdly, am I willing to obey the message He sends me. One late Saturday afternoon, while returning from visiting someone in The Lady of Mercy Hospital in the Bronx, I reluctantly stopped in the MCDONALD’S I mentioned earlier, to get one instead of the usual two apples pies. Armed with a single dollar, I approached the ordering line. There was a slight delay. It became clear the person ahead of me was having some foreign currency issues. To help our, I gave the young woman my Dollar. Another woman contributed. These, “Random acts of of kindness “ quickly resolved the issue. “ Twin girls “. She responded quietly. No bells or whistles sounded for me. Instead, there was a direct nudge for me to pronounce a blessing on her and her unborn twin girls. I asked her if I may. She responded affirmatively. I pronounced, verbatim, Aaron’s Blessing from Numbers 6:24-26. At the end, the blessed young woman thanked me then asked if I were leaving. I told her I would leave after getting my order. I curiously asked her why. “ I would like to speak with you”. Still wondering why, I waited for her. After getting our orders, we left MCDONALD’S, and she and I rounded the corner and stood to the left of the entrance to MacDonald on 232nd Street. .
What on earth could this stranger want to say to me? She spoke first. “ I truly believe the blessing you just pronounced on me is from God. It is the same blessing my family pronounce on each other at home in Saint Lucia.” She continued; “Even our two and a half years old pronounces this blessing on us. Wow! What was I to think? I do not believe in coincidences. As we continued our conversation, found myself staring at her while the details of my dream swam to the surface of my mind as if confirming she was the, “Subject” of my dream, and she resembles my younger daughter. When I chuckled, she became curious, so I told her of the dream. An immediate transformation occurred. She seemed to be comfortable with each other as complete strangers. After telling me her foreign names are Kashama Chigoji, her husband is Solomon and her son Sule Tsidkenue, and I told her my equally foreign sounding names are Marlegrecy N’Ovec, we started communicating like old acquaintances, or better still, we spoke like relatives. She told of her Christian faith and that of her family. I told her of my relationship with Jesus. Soon, we revealed our reasons for being in the Bronx. Hers was fascinating : to have twin girls. Mine was a potpourri of visiting an expectant daughter; seeing my three grands; editing a friend’s book and attending church services and exploring the very large prestigious Wood Lawn Cemetery where many late celebrities are interred. A bit of the macabre! I preferred Kashama’s reason for being in the Bronx. It was an exciting chapter on her parenting journey for her and her family. In response to my questions, she told me of some of her needs for herself and the twin girls. They were multiple and substantive. I felt the need to pray, so right there at corner of East 232nd Street and White Plains Road with an audience of able bodied men looking on, we held hands, bowed our heads and prayed. My friend, who called at that moment, joined us in praying per telephone. Kashama accepted my invitation to attend Wake Eden Community Baptist Church with me the next day. They welcomed her cordially and partnered with me in caring for while she stayed in the USA to have her babies. This collaboration epitomizes true Christian Love and Service. For the purpose of this report, I will hasten to say this dream, the unexpected MCDONALD’S rendezvous with Kashama are all a part of Father’s sovereignty at work. He had to find people to care for Kashama, her unborn twin girls and her family including her accompanying mother, who told me her daughter Kashama resembles me. Imagine that!!! Father also had to set the stage for His next foreign mission for me. Saint Lucia would be the next destination. 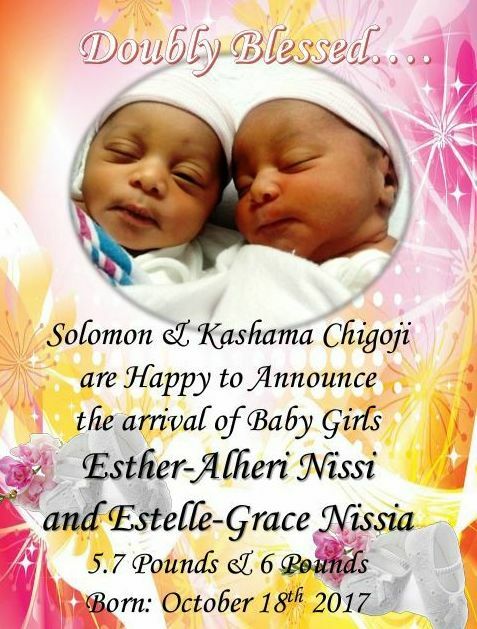 A month after Kashama had her beautiful girls Estelle and Esther, she returned to Castries, Saint Lucia. Her family invited me to visit and celebrate Father’s goodness to them. This became the catalyst for the short term mission with Youth With A Mission -Saint Lucia (YWAM SL). The Chigojis recommended me to Mr. Guy (Ghee) & Mrs. Marilyn Weka Fotso the directors of YWAM. They began the process of inviting me, gathering references, one of which came from Pastor Lia Willetts. The remainder of the letter dealt with the requirements to become a commissioned missionary under the auspices of the United Methodist’s Mission Board and questions about what level of support to expect from Christ United Methodist Church (CUMC) my local congregation. Up to this point, I was unaware that as a, “Methodist “ I should have first approached the Methodist Mission Board. My question about the Methodist qualifying procedure for becoming a commissioned mission is yet to be answered. I need to complete reading the informational booklet that was attached to the, “Cease and desist memo”. Like Kashama, I believed this opportunity to serve in Saint Lucia, “Is from God”. Armed with the command of the, “Great Commission” ( Matthew 28: 19-20) to, “Go” and with the assurance of the Holy Spirit’s perpetual Presence, I began my preparations. Time was crucially short, but our Sovereign LORD was at the helm. After discussing my call to serve in Saint Lucia with Pastor Lia Willetts, she advised me to contact the President of the Mission Committee. Since the Mission Committee was on a summer hiatus, President Daphne Forrester had to call an emergency session to determine how the committee would support my solo, unendorsed short term mission. The available committee members unanimously and graciously voted to purchase the airline ticket for over $683. USD. Pastor Lia Willetts generously added travelers’ insurance protection. I am still deeply grateful for this wonderful BOOST to launch my short-term mission. They encouraged and energized me. Thanks again! ! With Father’s unmatched help, I raised much of my remaining $2,555.00 via spontaneous contributions from one of the few recipients of my newsletter before I had to stop distributing them. The rest literally became history. This Christian Outreach was unlike any other I had undertaken. The limitations of time, lack of publicity within the Christian Community; an uncanny feeling of aloneness, bolstered my courage and resolve instead of derailing what I firmly believed was Father’s calling me to join Him in His work in Saint Lucia. Satan’s attempt to discourage and disparage me met the FERVENT PRAYERS of my spiritual partners; my unflinching faith and implicit trust in Jehovah Jihre’s ability to provide and His promise to, “Make all crooked places straight”. He raised up three homeowners in Lehigh Acres to engage me in gardening and landscaping projects through which I realized the major part of my budget. A brief “Gofundme” Campaign and the generosity of friends accounted for most of what I raised. I was confidently content that all would be well. Again, I am grateful to everyone, who contributed in any way to enable my Saint Lucian mission. God bless you always.